TWO-TIME GRAMMY® Award Winners, Cathy Fink & Marcy Marxer are master musicians with a career spanning over 35 years. Their superb harmonies are backed by instrumental virtuosity on the guitar, five-string banjo, ukulele, mandolin, cello-banjo, and many other instruments. An eclectic folk festival on their own terms, their repertoire ranges from classic country to western swing, gypsy jazz to bluegrass, and old-time string band to contemporary folk including some original gems. Their versatility defies a brief description, perhaps “well rounded Americana” does it best. In February 2017, the duo released their 45th recording, “GET UP AND DO RIGHT” which features duets of some of their favorite songs by songwriters such as Alice Gerrard, Tom Paxton, Ola Belle Reed and David Francey, with an original tune and song for good measure. Midwest Record reviewed the CD saying “with nothing more on board than the duo vocalizing with their strings and things, they give a master class in organic, acoustic music and show what a difference chops make…". Cathy & Marcy have performed at hundreds of bluegrass and folk festivals and taught at close to 100 music camps. 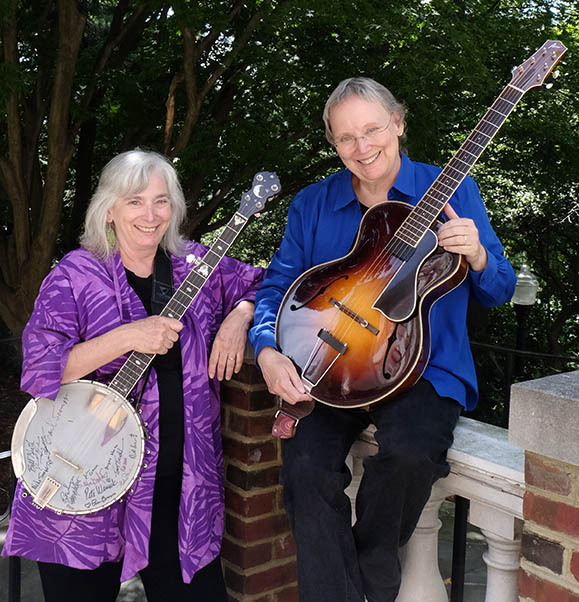 The Washington Area Music Association has recognized the duo with over 60 WAMMIE Awards for folk, bluegrass and children’s music. They have performed with Pete Seeger, Theodore Bikel, Tom Paxton, Patsy Montana, Riders in the Sky and a wide range of musical luminaries. ate a music camp helping others learn to play and sing. Past students include Kaki King and Rhiannon Giddens. Through their long relationship with the Music Center at Strathmore they collaborated with positive hip-hop artist Christylez Bacon. They continue to mentor up-and-coming artists on navigating the professional music world. They have entertained the Queen of Thailand, been keynote singers for the AFL-CIO, performed at hundreds of folk festivals, appeared on the “Today Show” and on National Public Radio. They have advocated in Washington for unions, health care for children and the rights and livelihoods of artists. As curators, performers and hosts, Cathy & Marcy produce A Tribute To Hank Williams at The Birchmere, in its twenty-third year. Their annual weeklong Ukulele & Guitar Summit at Strathmore goes into year 11 in 2019. Cathy & Marcy have earned two GRAMMY® Awards for their recordings “cELLAbration: a Tribute to Ella Jenkins” and for “Bon Appétit!”. Their CDs “Postcards” and “Banjo Talkin’” were both GRAMMY® nominated in the Best Traditional Folk Album category. Cathy & Marcy have toured worldwide from Japan to New Zealand, Vancouver to New York and everywhere in between. Shows include The Rock & Roll Hall of Fame and Museum (OH), Smithsonian Institution and the John F. Kennedy Center for the Performing Arts. American Voices Abroad chose Cathy & Marcy with fiddler Barbara Lamb to perform in China, Malaysia, Papua New Guinea and Vanuatu for the U.S. Department of State.